90% & 40% US Silver Coins. 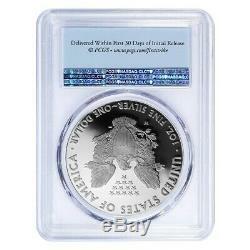 2019-W 1 oz Proof Silver American Eagle Congratulations Set PCGS PF 70 DCAM FDOI. PF 70 First Day of Issue. Bullion Exchanges offers this beautiful 2019-W 1 oz Proof Silver American Eagle Congratulations Set PCGS PF 70 FDOI. This latest US Mint Congratulations Set includes the American Eagle One Ounce Silver Proof Coin bearing the "W" mint mark of the West Point Mint. This coin was graded by PCGS as PF 70 - A fully struck coin, free of visual marks under 5x magnification. The First Day of Issue designation indicates that the coin was graded by PCGS within the first day of its release. 999 fine silver, with a weight of 1 oz. Produced by the US Mint. 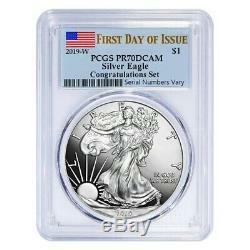 Coin comes in a PCGS Holder with the First Day of Issue label. Coin Bears the West Point Mint's "W" mint mark. PCGS PF 70 - A fully struck coin, free of visual marks under 5x magnification. Obverse: Features Lady Liberty draped in an American flag, walking gracefully as the sun rises over a ridge. Design created by Adolph A. Reverse: Depicts a heraldic eagle is shown below 13 small stars, representing the original colonies. Bullion Exchanges offers you an exceptional collection of spectacular proof silver coins from renowned mints all over the world. By purchasing from Bullion Exchanges, you are agreeing to all of our Terms and Policies. Bullion Exchanges reserves the right to refuse or cancel any order reviewed by our Compliance Team, which are deemed questionable or have increasing potential risk for being fraudulent. All customers are subject to a review at our own discretion, in which additional information, identification and/or documentation, may be requested. The submission of an order and subsequent receipt of a confirmation locks in your order and affects our metal hedging requirements and thus we are unable to make any price adjustments. Our in-house numismatist staff assign conditions to all products. The condition assigned to the products is derived from industry-wide standards. Please keep in mind that most images are stock images, and therefore you should not expect to receive the pictured products. Silver products, and some gold as well, may exhibit milk spots, and/or toning, which are normal and do not change the condition described in the listing, nor the value of the product. Coins that are holdered by one of the major grading companies are graded based on the condition they were in at the time of grading. However, at times, coins do tend to develop spotting or toning which are a normal happenstance in coins. Please keep in mind, the appearance of the toning and/or milk spots does not mean that the coin is not the grade specified on the actual slab. In instances where there is a discrepancy where the customer believes to be unjust, please refer to the grading companys guarantee policy. Purchasing bullion and/or coins involves price risk, and the purchaser assumes all such risk. We do not offer or make price adjustments based on the market fluctuations of precious metals, or for any other reason. We will never ask the customer to pay more for a product if the price significantly increased, so please refrain from requesting price adjustments after market prices decrease. The item "2019-W 1 oz Proof Silver American Eagle Congratulations Set PCGS PF 70 DCAM FDOI" is in sale since Monday, February 11, 2019.